Butch Anton (pictured), and his wife Sandy, hosted the third annual Letterhead Geezer Gathering at their home in Lake Park, MN. From August 2 to August 5, Butch “Superfrog” Anton and his wife Sandy hosted their third Letterhead Geezer Gathering at their home in Lake Park, Minnesota. 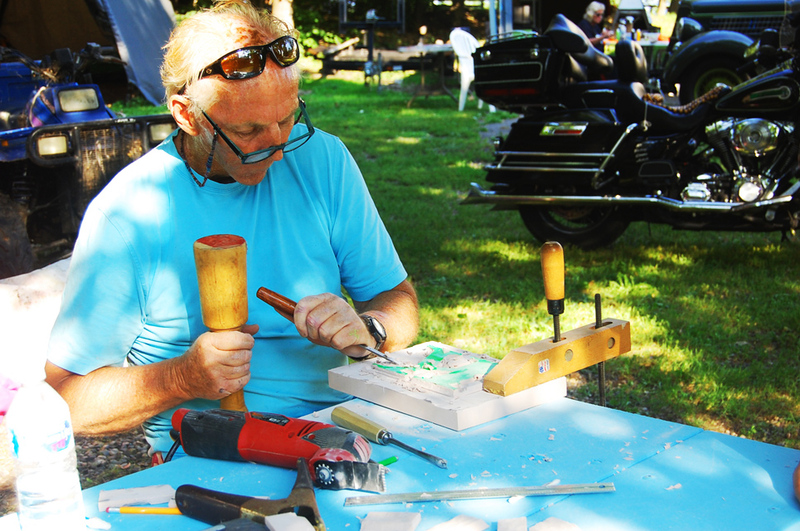 Along with educational seminars, attendees had the opportunity to enjoy the pleasant weather in the scenic Detroit Lakes vacationland of Northwest Minnesota. The 2018 Geezer Gathering featured seminars on carving, glass gilding, and lettering and pinstriping. 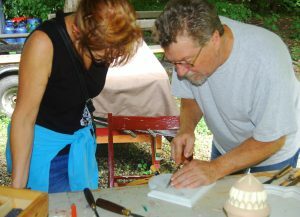 Barbara Schilling from Anoka, Minnesota conducted the glass gilding class. Her demonstration included producing a two-tone gilded glass panel. Mike Hoestra participates in Barbara Schilling’s gilding class. Schilling pointed out that much of the equipment and supplies needed for gold leaf work is very specialized. For example, you can’t run down to local 7-Eleven or Ace Hardware® and pick up a gilder’s tip or gold leaf size. 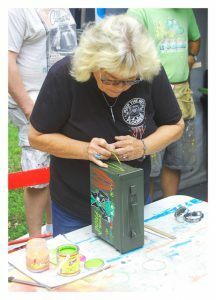 One attendee lends a hand in pinstriping a tool box. During her gold leaf seminar, in addition to displaying several finished panels for the attendees, Schilling described several different techniques that you can use to create a two-tone gild. Some of the other interesting effects that Schilling explained included gilding on chipped glass. 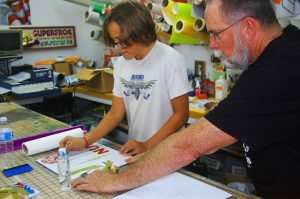 Mark Ripley, owner of Ripley’s Ol Skool Pinstriping in Olathe, Kansas, taught the fundamentals of striping to future sign makers and old geezers. Host Butch Anton and Mark Ripley, owner of Ripley’s Ol Skool Pinstriping in Olathe, Kansas, devoted much of their time instructing the future sign painters in attendance on how to hand letter and pinstripe. 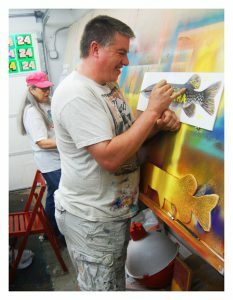 In addition to explaining painting techniques, the two “geezers” tutored others on job layout, tools of the trade, brush care, and color selection. 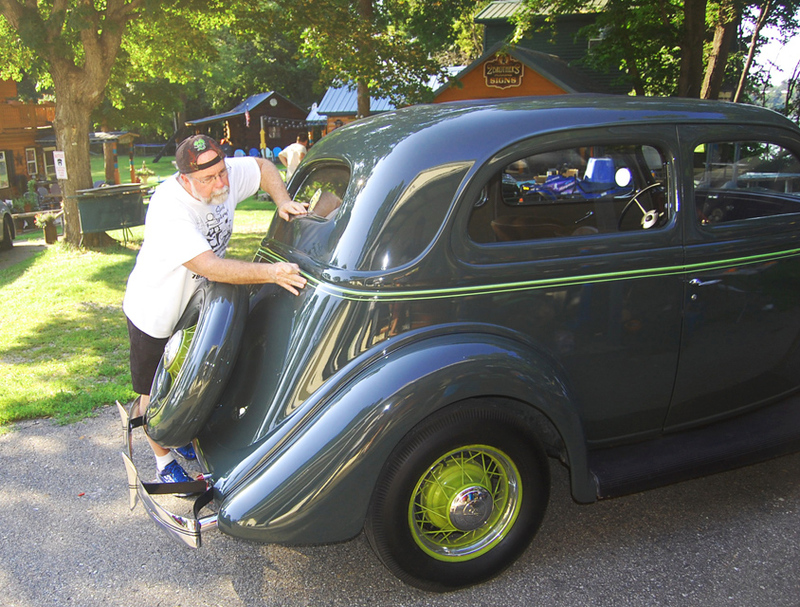 Rather than painting panels, the real test of a pinstriper’s skill is actually striping a car, which Mark Ripley demonstrated at the gathering. In pinstriping the Ford, Ripley used Du Pont Hot Hues urethane paint. As part of his demonstration, he explained how to properly prep a vehicle surface and layout the job. He also showed the procedure he uses to mix and match a color. In this particular case, Mark had to match the green, which was painted on the wheel hubs—not an easy task. Maris Schilling showed other sign makers how to carve incised letters out of Precision Board HDU, as well as how to sharpen carving gouges. 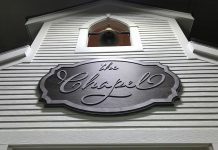 Maris Shilling and Anton also provided attendees with instruction on carving both incised and raised lettering in high-density urethane (HDU) panels. In teaching carving, they explained the tools needed, job layout, and priming and painting carved HDU. Coastal Enterprises, manufacturer of Precision Board™ HDU signboards, provided materials for the attendees of the gathering to use. 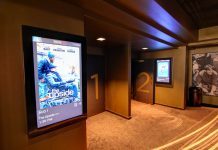 “What I like about the Precision Board materials is that they have a complete system of products matched for compatibility,” said Anton. 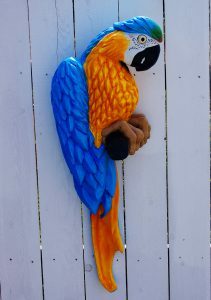 Butch Anton’s finished macaw that he carved out of Precision Board HDU. In addition to Precision Board, other vendors who helped sponsor the Geezer Gathering included Ronan Paint, Rapid Tac, and DuPont. These generous companies provided samples of their products for the attendees to use during this year’s event. As the gathering was wrapping up, Anton captained his pontoon boat and treated attendees to a tour of Big Cormorant Lake, which adjoins his three-acre estate. The maritime excursion capped off what proved to be an enjoyable, informative three-day get together. 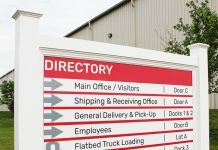 This article also appears in the November 2018 issue of Sign Builder Illustrated magazine.